Jupiter is the most massive planet in our solar system; with four large moons and many smaller moons it forms a kind of miniature solar system. The massive planet will be in opposition to the sun this weekend. This glowing image of the solar system’s largest planet was taken by skywatcher Jean-Luc Dauvergne from his native France. Jupiter will take center stage in the sky this month as it nears opposition to the sun. At opposition, expected on Oct. 29, Jupiter shines opposite the sun in our sky. Jupiter will rise in the eastern sky at sunset, stay out all night long and set in the west at sunrise. The Earth in its orbit swings between the sun and Jupiter on Friday night (Oct. 28). 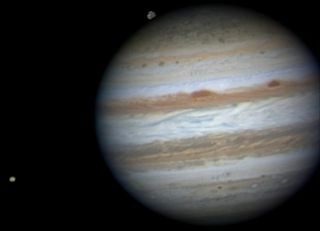 Skywatchers may be able to view Jupiter and some of its moons with a modest telescope this weekend. This image was made with a Basler Scout camera through 4 filters. It was captured on Oct. 13 with a 1 meter telescope at the Pic Du Midi mountain top in the French Pyrenees. Multiple exposures were made to collect enough light for an image that would not be evident to the naked eye. Oppositions of Jupiter occur roughly every 13 months. It takes the gas giant much longer to circle the sun than it does Earth — about 11.9 Earth years. Periodically, Earth overtakes Jupiter, crossing between that planet and the sun, to create opposition. The photo also captures Jupiter's icy moon Ganymede, emerging from behind the planet in the top of the image. The volcanic moon Io also enters the frame near the lower left edge. Jupiter has at least 63 moons, which are named after the Roman god's many lovers. The four largest moons of Jupiter, called Io, Europa, Ganymede, and Callisto, were discovered by Galileo himself, and are known today as the Galilean satellites.